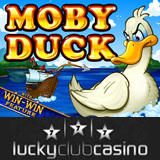 The new Moby Duck slots game at Lucky Club Casino is a light-hearted twist to the classic tale of high seas adventure. Its Ship scatter symbol triggers up to 50 free games and five-of-a-kind pays 10,000 times the line bet. Like many of the unique NuWorks games at Lucky Club Casino, this one has the patented Win-Win Feature that turns even the smallest Feature wins into prizes fit for a sea captain. To try out the new game, players can claim a 100% deposit bonus (up to $300) by entering the coupon code MOBYDUCK when they make a deposit. This offer is valid until October 25th. The Win-Win bonus feature awards prizes up to 1000 times the original slots bet and is triggered at the end of the Free Games feature when the overall win during the round is less than 10x the triggering slot bet. Other games with Win-Win include African Skies, Camper’s Cash, Mammoth Wins and Monster Millions. During regular game play a Moby Duck Wild symbol doubles the payout for that line. In the free games feature, it animates across the reels transforming all Ship, Captain and Harpooner symbols into Moby Ducks. With a metro-style iPhone look, Lucky Club Casino offers more than 30 casino games including video slot machines, video poker games (Deuces Wild, Jacks or Better, Joker Poker) and table games (Baccarat, Blackjack, Let ´em Ride, Tri Card Poker). The biggest progressive jackpot at Lucky Club is the Monster Millions jackpot, which is currently over $1,007,000. The African Skies / Greek Goddess / Duck Ages jackpot is over $80,000 and the Let’em Ride jackpot is nearly $25,000.